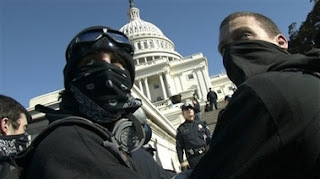 Washington, D.C., U.S. - Some 200 to 300 demonstrators, with the "Radical Youth Bloc," broke through police lines in an attempt to rush the U.S. Capitol building Saturday. Protesters got as far as the Capitol steps where anarchy symbols and various slogans including "you can't stop us," where spray-painted. The demonstrators where part of a breakaway group that left the larger permitted demonstration organized by United For Peace and Justice on the mall. Later the anti-capitalist bloc vandalized a military recruiting center where a window was broken.